WASHINGTON — North Korea is threatening to cancel President Trump’s upcoming nuclear summit with Kim Jong Un because of joint U.S.-South Korean military exercises, though the United States downplayed the sudden uncertainty. Trump and Kim are scheduled to meet June 12 in Singapore as Trump seeks to pressure the North Koreans into giving up their nuclear weapons programs. U.S. officials, caught by surprise, said they have received no formal notification from the North or South Korean governments, and no formal protest of the military exercises from Kim’s government. “We will continue to go ahead and plan the meeting between President Trump and Kim Jong Un,” said State Department spokesperson Heather Nauert. That planning includes a visit to the White House next week by South Korea President Moon Jae-in for a meeting with Trump. Nauert added that, in the run-up to the scheduling of the summit, Kim had “said previously that he understands the need and the utility” of the joint military exercises involving the South Koreans. The U.S. Defense Department said the military exercises are annual events, designed to help the U.S.-South Korea alliance defend itself in case of attack. “While we will not discuss specifics, the defensive nature of these combined exercises has been clear for many decades and has not changed,” said Army Col. Robert Manning, a Pentagon spokesman. The South Korean news agency Yonhap reported on the threatened cancellation, the first hitch in talks about the summit since Trump announced March 8 he had accepted Kim’s invitation. Yonhap reported that the two-week military exercise between the Americans and South Koreans began Friday. North and South Korean officials were scheduled to meet Wednesday to discuss ongoing efforts to reduce border tensions, including proposals to re-unite families separated during the Korean War of the early 1950s. The South and North Koreans are also talking about a formal peace treaty, as they are technically still at war; the original Korean conflict ended with an armistice signed in 1953. In announcing the cancellation of the meeting with the South Koreans, the North Koreans said that “the United States will also have to undertake careful deliberations about the fate of the planned North Korea-U.S. summit in light of this provocative military ruckus jointly conducted with the South Korean authorities,” Yonhap reported. 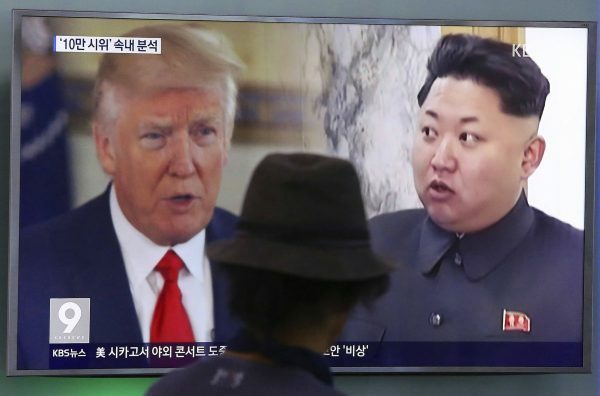 The threat to the Trump summit as well came just days after North Korea announced it would dismantle a nuclear bomb test site sometime May 23 to May 25, part of its its pledge to discontinue nuclear tests. Last week, the North Koreans released three U.S. prisoners, clearing the way for Trump to announce the date and location of the summit with Kim.